It might be logical to expect Cristiano Ronaldo to play the key role in turning around Real Madrid’s fortunes following their sudden loss of form. Logical, because Ronaldo has served as Madrid’s symbolic and iconic leader for so long, it can be difficult to imagine anyone else possibly being more important to the team’s fortunes. But that is a false conclusion, for two reasons. Firstly, Ronaldo’s playing role has significantly changed. Whereas he used to be a box-to-box marauder, advancing age has seen him evolve into an old-fashioned centre-forward who does little work outside the penalty area. Ronaldo’s unmatched determination to score goals, and his ability to do so, mean that he can still play that part perfectly well and he will surely continue to notch many match-winning strikes for a long time to come. 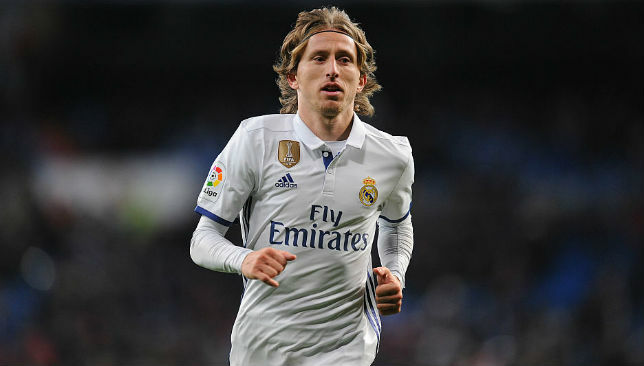 But it also means he is little more than a peripheral character in Real’s overall play, which brings us to the second reason for Ronaldo’s declining importance: Luka Modric. With Mesut Ozil and Xabi Alonso already established as regular starters, Modric initially struggled to impose his authority in midfield and often looked lost in the hard-running counter-attacking of thenmanager Jose Mourinho. But Modric has got better and better with every passing season, and the greater emphasis upon ball retention employed by Zinedine Zidane has allowed him to further blossom, to the extent he is now Real’s key player. Modric, more than anyone else, is responsible for linking Madrid’s midfield with the attack, receiving the ball from Casemiro or Toni Kroos to probe forward and deliver passes into the forwards or the attacking full-backs, using his wonderful passing range to pick holes in the opposition defence. On Saturday, with Madrid desperate to get back on track against Malaga, don’t be surprised if he rises to the occasion again. Sevilla saw off Real on home soil. On a symbolic level, there could have been no more appropriate scorer of Sevilla’s dramatic winner against Real Madrid on Sunday than league debutant Stevan Jovetic. He was snapped up by Sevilla’s sporting director, Monchi, who has made a specialty out of finding players in similar situations, and then thrust into the action by manager Jorge Sampaoli, whose decision to introduce Jovetic in place of Franco Vazquez paid off in spades when he scored the winner. 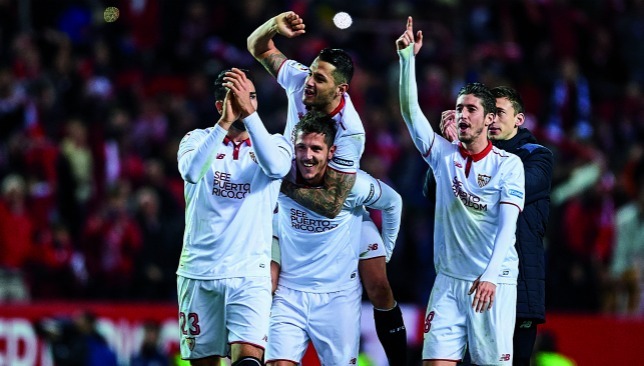 And there, in a nutshell, is the story of Sevilla’s success this season: talented, hungry and cut-price players spotted by Monchi and utilised to great effect by Sampaoli. The equation has added up to a remarkable season, with the Andalusian club through to the last 16 of the Champions League, where they will play Leicester, as well as mounting a serious challenge in La Liga. Many Barcelona fans who celebrated Jovetic’s winner appeared to miss this fact, but that goal actually sent the Catalan team down a place in the standings, with Sevilla leapfrogging them into second, just one point behind Real (who have a game in hand). And the big question in Spain now is whether Monchi and Sampaoli’s men will be able to maintain that challenge as winter turns into spring. There has been, of course, a recent precedent for an outsider enjoying glory in Spain with Atletico Madrid breaking Real and Barca’s duopoly by winning the title in 2014, as well as going close in the last two seasons. And now Sevilla are threatening to turn a supposed ‘two-team league’ into a four-horse race thanks to the impressive improvement under Sampaoli, who has rapidly become the world’s hottest coaching talent since replacing PSG-bound Unai Emery in the summer. In addition to the manager, pre-season saw a major turnaround in playing staff at the Estadio Ramon Sanchez Pizjuan, with last year’s stars Kevin Gameiro, Ever Banega and Grzegorz Krychowiak departing. But Monchi worked his magic once again, with Samir Nasri, Pablo Sarabia, Wissam Ben Yedder and Vazquez catching the eye since joining Sevilla this season. There have also been outstanding contributions from existing players like all-action winger Vitolo, powerhouse midfielder Steven N’Zonzi and rising young goalkeeper Sergio Rico. The key to it all has been Sampaoli’s ability to quickly gel together his assembled talents into an effective unit, and the Argentine has done so in an exciting manner with a dazzling array of attack-minded formations and tactical approaches. From one game to the next it is never easy to guess who Sampaoli will select, or whether they will line up in a three-man defence or a flat-back four. With his emphasis on fast-paced passing, high pressing and rapid transitions, Sampaoli is every inch the modern manager and the influence of Marcelo Bielsa upon his thinking is easy to see. In the coming months we’ll discover exactly how far he can take Sevilla – and it will be fun to find out. Each week, Sport360 brings you the best five players from La Liga, as chosen by you the supporters through our ValoraFutbol fan ratings tool. YOU have direct influence on who appears in each Top Five, so be sure to rate each weekend. What do you make of this week’s ratings? 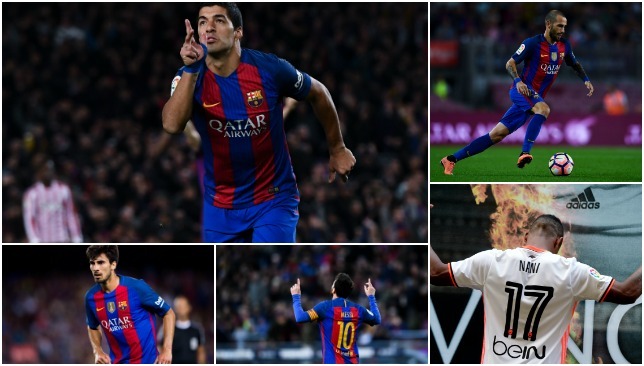 Luis Suarez has been a goal-scoring machine ever since his arrival at Barcelona, and against a not-so-strong Las Palmas team you would fancy him to score a few. And that is exactly what the Uruguayan did. A 14th minute goal from Andre Gomes’ ball, hit on first touch by Suarez gave Barca the lead. And after being offered too much space and time on the ball, Suarez again made Palmas pay the price with his second goal. Barca’s third goal too might have been scored by Arda Turan but it was Suarez’s counter-attacking run and a shot that rebounded off the keeper, that was instrumental. The Argentine genius played a vital part in Barcelona’s 5-0 victory at home. Messi made some terrific dribbles, runs into the box and sublime, at times key, passes in the final third. There was no need for a last-gasp free-kick and Messi also missed a one-on-one with the goalkeeper, but he did score a tap-in and looks in good touch for the remainder of the season. Valencia finally ended their winless streak after winning 2-1 against Espanyol, and it was a decent performance from Nani who threatened the Espanyol defense throughout. Nani provided the assist to Martin Montoya for the first goal of the game and an in-form Nani might help Valencia to get their La Liga campaign back on track. The Barcelona full-back has not been first choice under Luis Enrique, but after a stellar game against Palmas, it looks as though he might now get more first-team appearances. Vidal played a part in Barca’s first goal and also scored their fifth. The midfielder played a vital role in taking control of things in the midfield. He made the all-important run and provided an assist to Suarez for the first goal and Gomes will take plenty of confidence from the game against Las Palmas. He was both physical and creative, a sign of positive things for Enrique and Barcelona in the future.